Prominent & Leading Manufacturer from Mumbai, we offer artificial grass for balcony. Sundek Sport Systems offer a wide range of Artificial Grass for Balcony. Owing to the industrial expertise gained by us since our inception itself, we have been able to produce a wide range of qualitative Artificial Grass for Balcony. We have manufactured this range in a wide variety of specifications and sizes to cater to the variegated requirements of our clients. This grass turf/artificial grass is an absolute replica of the original grass surface minus the mud effect especially after the mud get wed with rains and creates a mess. We believe in quality and we deliver artificial grass for balcony that is performance efficient and reliable. 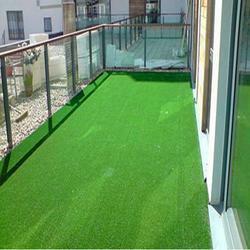 We offer our Artificial Grass for balcony in competitive rates in the market.